and the first book of the exciting City Hall series! By popular request (and necessity, LOL), here are some of your questions about the new book, answered. I've read the Wisteria Witches series by Angela Pepper. I see this book is called City Hall #1. Where does this fit in? And who's Zinnia? Zinnia Riddle is the character you've come to know and love in the other books as Aunt Zinnia. This is Zinnia's first book as the featured character. 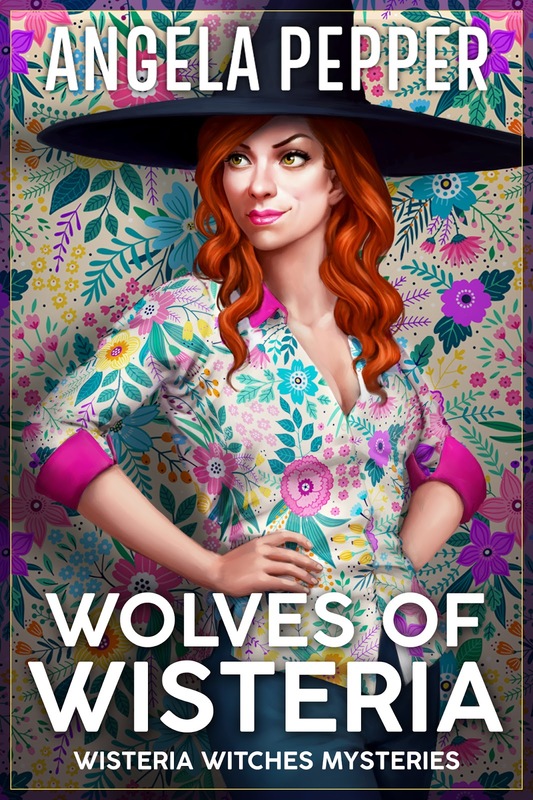 The events in Wolves of Wisteria take place in the months leading up to Zinnia's niece Zara arriving in Wisteria. You can think of this book as a prequel, or a spin-off, or the start of a mini-series. In this book, you'll find out about Zinnia's workplace and witch friends, plus there's a thrilling mystery to solve. Will there be more books about Zara? Yes. The next three featuring Zara will be labelled Wisteria Witches - Daybreak. They're scheduled for release in late 2018. I haven't read any other Wisteria Witches books. Can I start here? Absolutely! Wolves of Wisteria can be read as a stand-alone novel without spoiling the other books if you decide to read them next. What's a witch cozy? Is it a pointy hat? No, it's not a hat! Witch cozies are similar to contemporary cozy mystery books in that they revolve around a mystery and feature an amateur or unconventional sleuth. The tone is humorous and breezy with a few good thrills, too. Witch cozies come with the added bonus of paranormal elements. The town of Wisteria is full of many supernaturals, including gorgons, vampires, shifters, mages, and more! 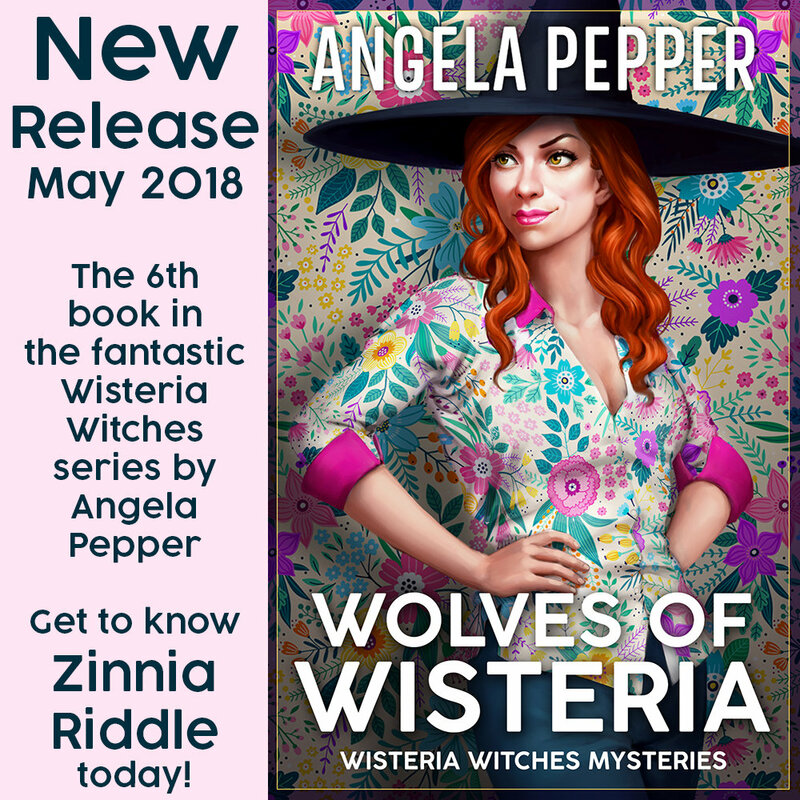 Angela Pepper's Wisteria Witches series features a wise-cracking mother and daughter witch duo, Zara and Zoey Riddle, and their aunt, Zinnia. This urban fantasy series has plenty of magic and supernatural elements. New to Wisteria? You can start reading with any book 1. The books are listed below in their release order, but not necessarily their chronological order. For example, Wolves of Wisteria takes place in the months before Wisteria Witches book 1. Zinnia Riddle doesn't use her witch powers much these days. She works as a clerk at the Wisteria Permits Department, where there hasn't been much need for spells and potions... until now. When a beloved coworker is found dead next to her desk, the whole office gets paranoid. Is one of them a killer? Did the victim leave behind clues in the book she was writing? Is there a town-wide conspiracy, or is some lone serial predator on the loose? The police are always two steps behind the evil that's threatening the peaceful town. Now it's up to Zinnia Riddle and the witches in her coven to uncover the secrets hiding in plain sight. Will Zinnia's rusty magic hold up against a powerful enemy? 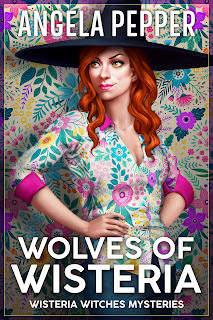 WOLVES OF WISTERIA is the sixth book set in Angela Pepper's Wisteria Witches universe, and the first book featuring Zinnia Riddle in her own thrilling mystery! Available now on Amazon for sale or through Kindle Unlimited. Paperback coming in June or sooner, Audiobook coming in July 2018. Sorry to those of you who were so excited about a new Wisteria book you just started reading it and were a little confused for the first chapter! But I'm glad you were that enthusiastic!